When is the Best Time to Build a New Home? | Omaha, NE Real Estate Agents The Bill Black Team Video Blog Omaha, NE Real Estate Agents The Bill Black Team Video Blog: When is the Best Time to Build a New Home? When is the Best Time to Build a New Home? We've seen a ton of new construction lately, which has been prompting a lot of my clients to ask, "When is the best time to build a home?" I'd like to answer that question today, while giving you advice on what you should start planning for before you even call a builder. This year, the best time to build a home is coming up, in the early spring. 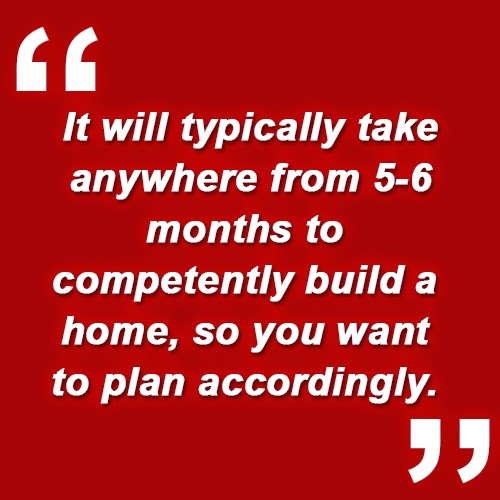 It will typically take anywhere from 5-6 months to competently build a home, so you want to plan accordingly. Although it's still winter, it's not too early to start planning your new home. You want to give yourself anywhere from 4-8 weeks prior to breaking ground. You've got to meet with a builder, finalize plans, and apply for a permit before you lay the foundation. In whole, the entire building process should take about 7 months from start to finish. If you want to be moved into your new home by the time the kids start school again next fall, you should start planning soon. We have a ton of great lots right now and would love to show you them. If you have any questions, or would like to take a look at some lots, feel free to give us a call or send us an email.